This is my official "Hello Kyoto" Video. My offer of being a "human collective property" to hanare project was rejected due to some psychodelic left-wing-fair-employment-we-don't-want-to-own-somebody-ethic. 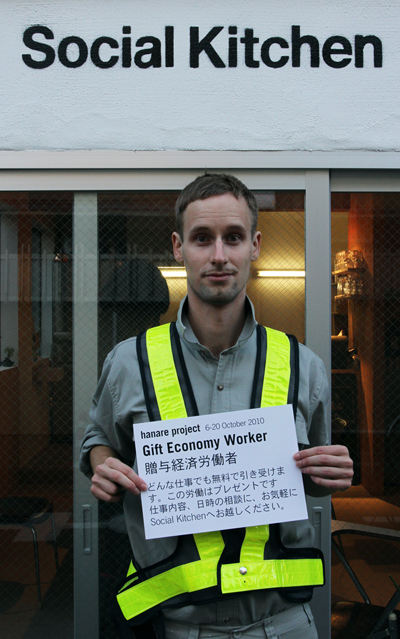 But they agreed to-accept me as "gift economy worker", so let's get it started, Kyoto! I work for free, just tell the people of Social Kitchen whenever you need me, and I'll be flying over. I proposed a collective experiment to hanare and its connected cultural spaces "Social Kitchen" and "hanarerad" (Kyoto/Japan), with my physical self in the very center: I will become collective property of hanare for the limited time of 2 weeks. Hanare can use me to serve its very own purpose, whatever this might be. As this proposal was rejected by majority vote, we developed another guideline for this social experiment. Hanare and its protagonists see themselves as strict opponents of vertical hierarchies, and I could convince them only by reinterpreting my submissive offer into a gift. The 2 weeks of free work are now a present between friends. Nevertheless, we signed a contract, giving hanare the right to use my labour for their own needs as well as to give it away to the public (if it serves for the "collective good" according to hanare, could by neighbours, friends, customers of "Social Kitchen") - on the other hand, hanare is providing clothes, food and accomodation for myself. There's a bunch of motivations for me doing this project: Today's artist-in-residency world runs mainly in this scheme: the artist comes for limited time to an institution, the latter provides a basic infrastructure, maybe some funding, the artist produces art (may it be a tangible art piece, a process, research etc). Both parts will earn reputation, recognition in the public. The artist work is per definition egoistic: in that respect that the artist does everything to get his idea done. The institution supports the artist to realize his work. With my stay at hanarerad I also want to play this game- but at the same time turn it around: As I do it in many of my artistic projects, I give the authorship to hanare, they will decide what the gift economy worker should do. This work is the consequence on the prejudice that art is a self-referential game with no other use for the public than to entertain its stakeholders. I want to interprete this prejudice literally and work for short term practical outcome, for tangible, concrete results and to show that art can be "real work". At the same time I am curious to see how people deal with free labour - especially in a culture that immediately connects an obligation to a received gift or service. In the context of hanare and its ethic policy, my project could also serve as a starting point for the discussion of working conditions in Japan and alternative trade systems.